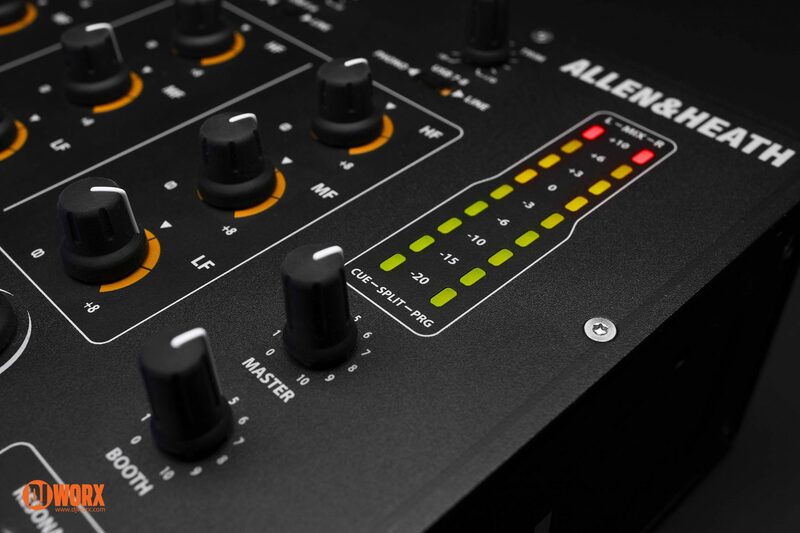 Allen & Heath is world-renowned for their great sounding analogue mixers and the juicy filters that usually come built into them. My earliest encounter with them was my friend’s Xone:32 over 10 years ago. The first in the Xone series was the Xone:464, a more DJ friendly version of the gear Allen & Heath was famous for: studio and live mixing desks. I personally own an ageing Xone:62, which while far from the perfect mixer, is the sturdiest and the best I’ve ever owned. 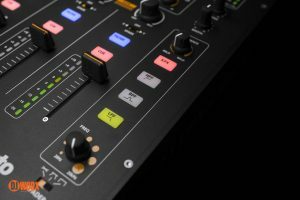 In recent years, Allen & Heath has been slowly launching a new generation of Xone mixers, starting with the Xone:23 and 23C, a two channel lineup, with the 23C sporting an audio interface and a copy of Mixvibes Cross LE. Now, the company has brought out a four channel club mixer to match. How does the Allen & Heath Xone:43C stack up compared to its parentage, as well as the competition? 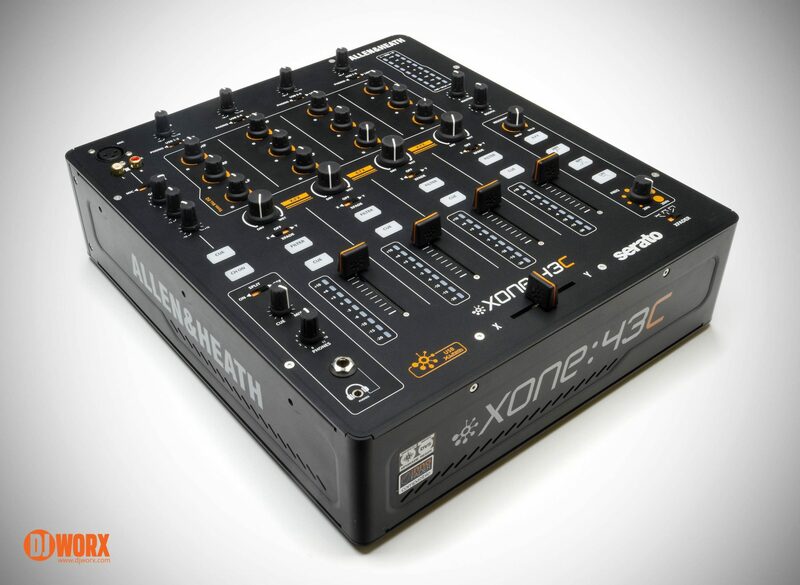 The Xone:43C a 4+1 analogue club mixer with built-in audio interface that’s Serato DJ DVS ready. 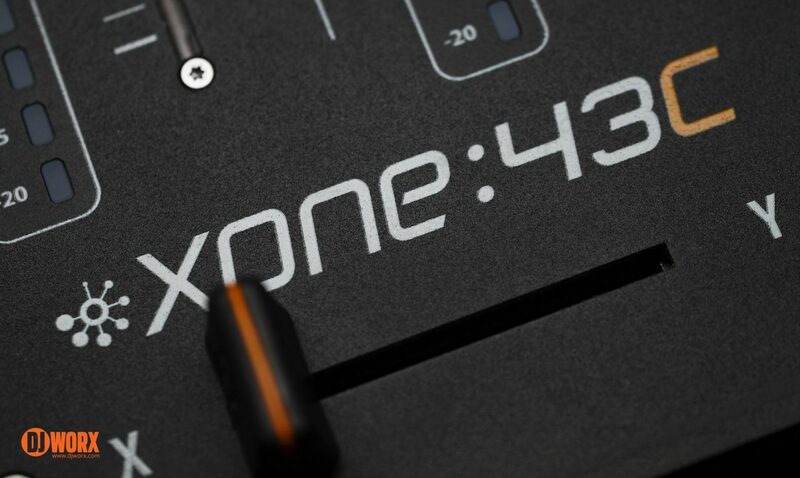 The Xone:43C is sister to the 43, which is the sequel to the popular four channel mixer, the Xone:42. 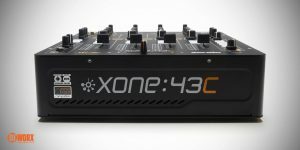 Like all Allen & Heath club mixers, the Xone:43C is very well built. My standard quick test to work out build quality is what I call the ‘knob wobble’, where you twiddle the controls to see if there’s any give. Usually, sturdy parts are screwed into the face plate, not just the internal circuit board. With the 43C, everything is fixed in place. You see a lot of complaints online and at expo booths about the Chinese-made gear, but if anything, this mixer is better built than my ageing Xone:62. On top of that, the rounded chassis is very sturdy, and has a lot less sharp edges to catch on your clothing or cables when you’re moving past it. 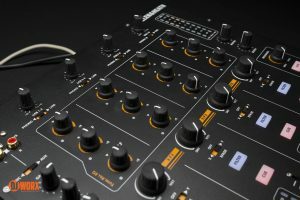 The layout is generally as you’d expect from a club mixer, with the four channel faders taking centre stage, microphone and headphone controls on the left, and master output controls on the right along with your filter. Mark, with his twitchy design spirit, was happy to see that all the channel strips (including the rear panel) line up, with nothing off-centre. It is a nicely balanced mixer. 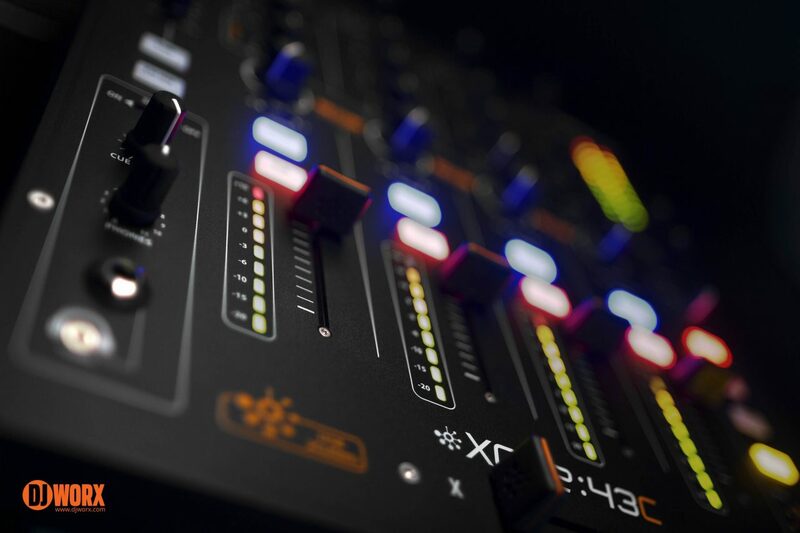 When the Xone:23 first arrived, the two channel mixer sported a brand new look. Gone were the greys and silvers of older mixers with a black, red and orange colour scheme along with a unique shaped faceplate. We had a discussion at DJWORX HQ (OK, well on our Slack channel, anyway) and all agreed it was a striking change that modernised the brand. Having given the Xone:43C a go in a near-club environment (my friend has a dark, strobe-and-smoke-filled garage with a huge PA), the darker scheme is definitely not good for dark environments. There just isn’t enough contrast on the mixer to see what you’re doing in the dark. 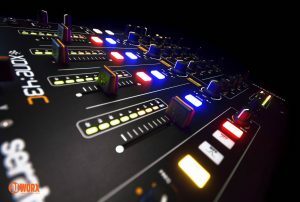 The channel faders are black, with red marker lines on, so it can be hard to see what your volumes are set at with a glance. On top of that, the VU meter LEDs are not very clear. In the dark, there’s bleed between the different level indicators making the level at which each light is peaking ambiguous. Previously, the VU meters were much more individually defined since they were actually individual LEDs poking through the faceplate. Speaking of VU indicators, the AUX/MIC channel lacks any sort of peak volume indication outside of the master output. If you’re hoping to use the channel as an extra input for your music, you may find it a bit of a guess. The AUX channel does have gain control, a two-band EQ to keep things under control and can be fed through to the headphone cue. This is all pretty standard on four-channel club mixers, but worth being aware of. 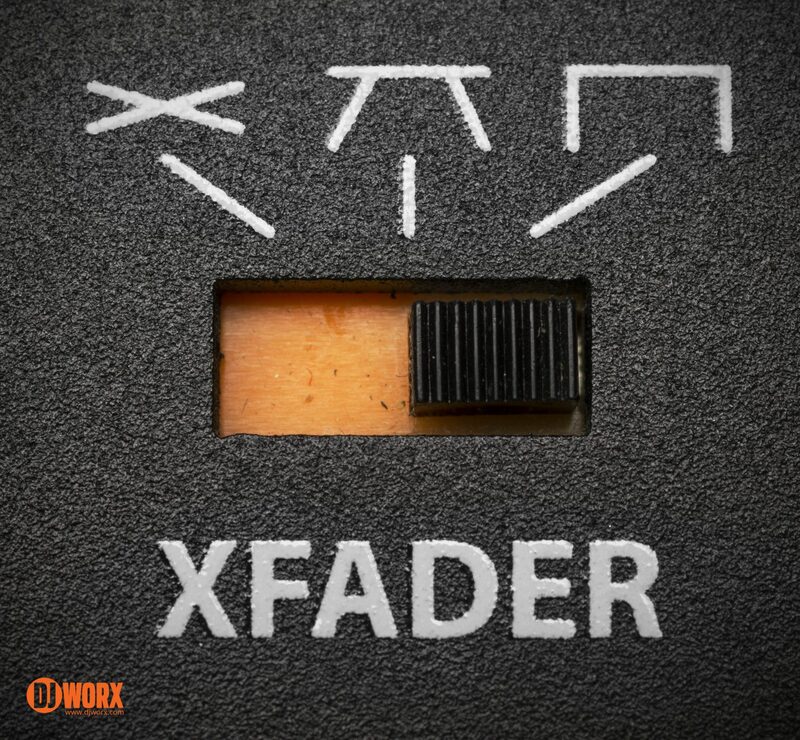 As is inevitably a question that’s asked during mixer or controller reviews, yes, the Xone:43C cross fader is Innofader compatible. While the built-in one is not a fancy-pants scratch fader, it feels fairly loose and responsive. 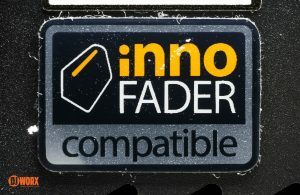 To the right of the crossfader is a three-point switch to change your fader curve between dipped, dipless and fast cut. 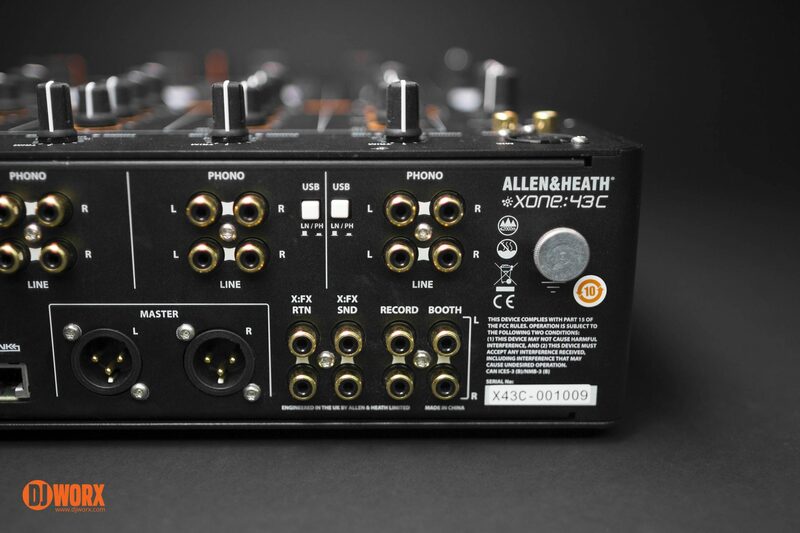 Along with the expected USB port to connect your audio interface, the Xone:43C also supports Allen & Heath’s proprietary X:LINK connection via an ethernet port on the rear. 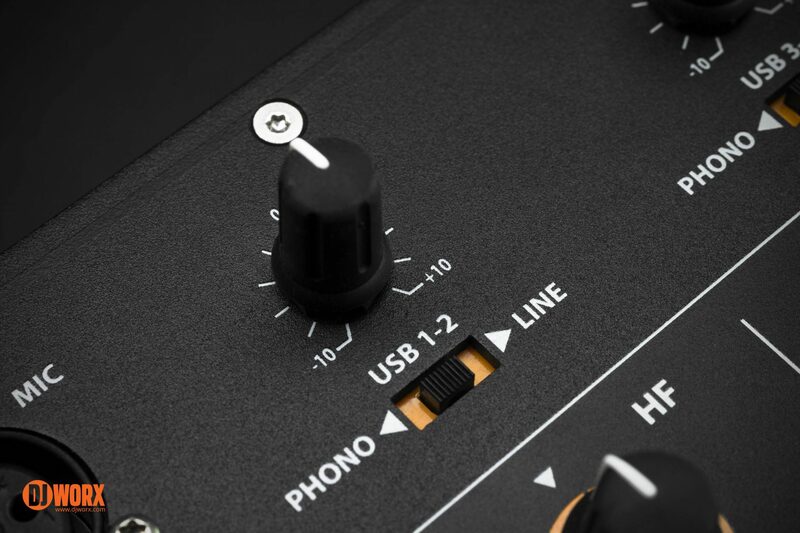 This allows you daisy chain controllers such as the K1 or K2 to the audio interface, to send control data and power. 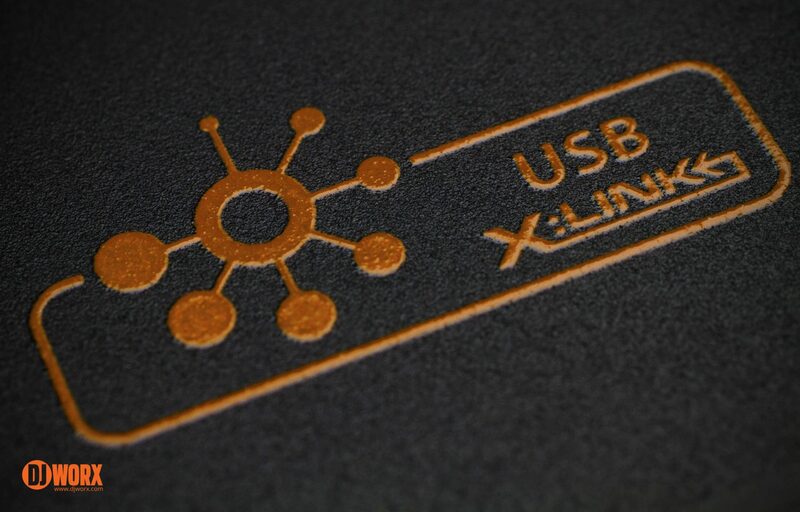 You might not have less cables generally, but you’ll have less USB cables plugged into your laptop. As an aside, I really wish all the creators of all these systems like X:LINK would open them up for general use. When they’re only available on one manufacturer’s hardware, it ends up fading into obscurity when no one uses it. I get why they do it: companies think that it encourages lock-in, but what actually happens most of the time is users end up with extra stuff on their hardware they never get to use. It’s particularly frustrating when something like this is fairly useful and practical. One thing you’re guaranteed to get when you buy from Allen & Heath is their tried and tested filter. The one on the Xone:43C comes with three settings: high-pass (HPF), band-pass (BPF) and low-pass (LPF). Along with these, there’s also a fourth setting for X:FX, the Xone effects system for send/return on outboard effects units. First, let’s talk about the filter. 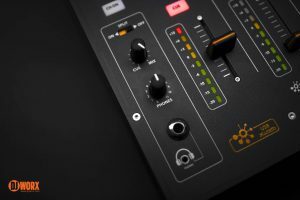 Unlike a lot of modern mixers and controllers that have a high/low pass filter on each channel, Xone mixers tend to have one analogue filter that is assigned to channels, meaning you can’t individually tweak channel audio. The payoff is that it’s a very nice sounding filter. There’s lots of punch, you have the different pass types and you can tweak the resonance from MILD to WILD. The downside is that there are still the same issues with the filter as there have been since the Xone series came out. First, there’s a noticeable crackle in the audio when you press the button to activate the filter on a channel. This can be subtle and not a huge issue, but at times (particularly if you’re quickly pressing the button) it’s unavoidable. The second problem is that when the FILTER button is activated, there’s a change in the audio output, almost like the filter amplifies the sound. Even with the filter frequency disabled, you get a meatier audio output that only stops when you turn off the filter button. Neither of these things is the end of the world, but after 15 years of Xone mixers, it’s disappointing they haven’t been addressed. It can also be a bit confusing when using the frequency sweep control pot, particularly since the HPF and LPF operate from opposite sides. If you’re using the low-pass filter, and quickly change to a high-pass filter, you need to turn off the filter on the channel, reverse the sweep knob then reactivate the filter on the channel before you can use it. The 43C uses the standard three band EQ, much like its predecessor. 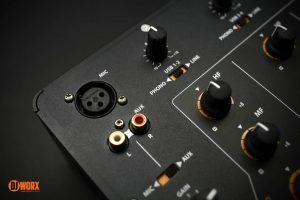 One thing Allen & Heath became famous for with the Xone:62 and 92 was the use of the rather unique four-band EQ, which allows for finer control of audio on each channel. This idea didn’t continue through to the 42 and 32, and it looks like it’s shelved for the more expected hi/mid/low. Personally, I prefer the flexibility of four EQs, but it suits my style of mixing and music genres much more. If you squint hard enough at the EQ section, you’ll notice the EQs claim to be infinite. Most mixers tend to have a maximum cutoff of around 26 dB, but infinite EQ across the bands kills the whole sound. In testing though, you can still hear a faint sound of the music with all the pots turned all the way down. This really isn’t much of an issue, but this is Allen & Heath we’re talking about! With companies like this, the devil is in the details. There are four prominent centre-click pots below the EQs that operate the wet/dry for the X:FX loops. 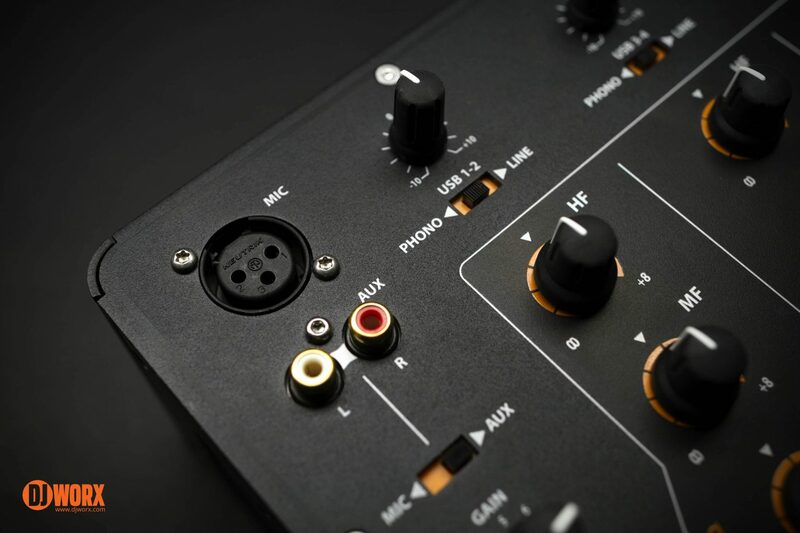 On many mixers, this would be where the channel filters sit, but for some reason, Allen & Heath have devoted prime real estate to a feature that isn’t nearly as widely used. Yes, outboard effects units still exist. Yes it’s good to have the feature on a club mixer, but right in the middle of the front panel? It’s not even like the company make their own effects unit (although, now that you mention it… it could be interesting to see the effects engine on from the DB4 as its own hardware). I’ve now started looking at the wider picture regarding how manufacturers interact with potential customers and gear owners via their websites and overall brand. While not the be-all and end-all, it’s still an important part of the user experience, particularly if there’s a problem. With Allen & Heath, we definitely have a certain pedigree the brand must live up to. 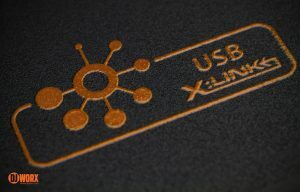 While the website isn’t the most expansive in the world of electronics, the support sections do the job: there’s somewhere to download your drivers and manuals as well as a knowledgebase. I just really wish that A&H would capitalise on their fan base and have a community area for DJs and producers that like and use their gear. Not just that, but use their strengths! 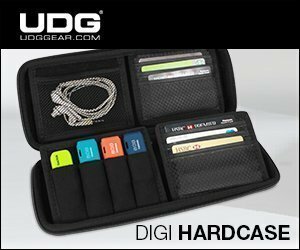 They’re a company famous for great audio quality and mighty hardware. A community area that give people somewhere to show that off would be great. Feeding audio through this mixer is as straightforward as selecting the right source. Digital audio on each channel comes from the USB selection on the switch, but there’s also the usual phono and line-in. You have to remember that this is essentially a Xone:43 with an added audio interface, so all that changes is the additional routing option. 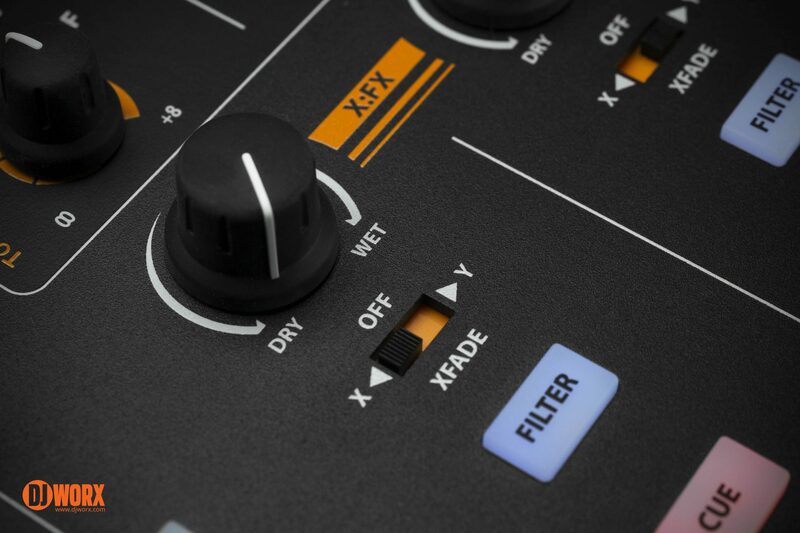 Apart from the issues with the filter, the huge X:FX knob taking up real estate and the dark colour scheme, the layout is classic, tried and tested and eminently useable. Everything feels where it should be while you mix, even if visual precision can be difficult. 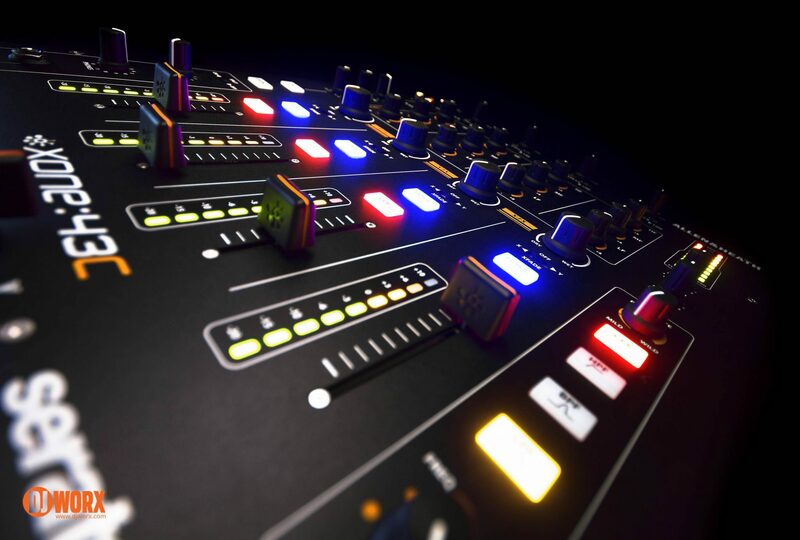 I did notice that the channel faders seem to be shorter than older Allen & Heath mixers, though. 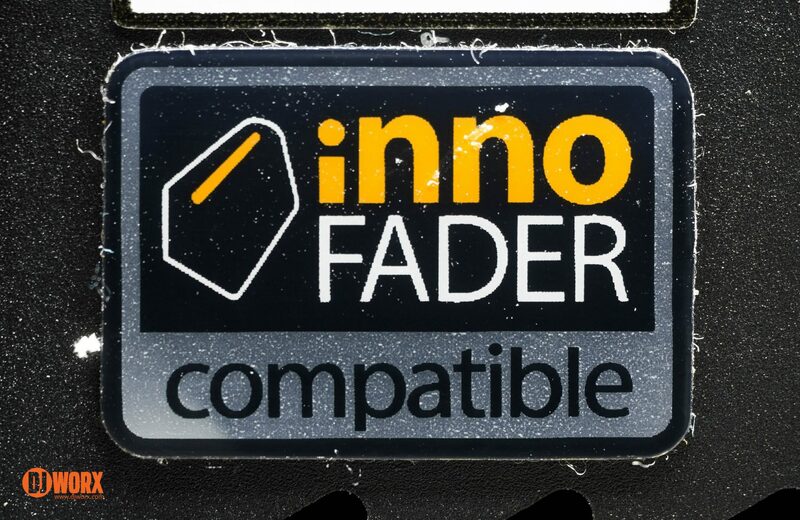 Judging by the pictures (and my 62) they’ve gone from a 60mm fader to a 45mm one, probably to save money, which is a bit of a shame as the longer faders give better control over the volume of the channel audio. I ran some vinyl audio through the mixer and managed to hear a very slight hum in the background that I haven’t heard on my own mixer. 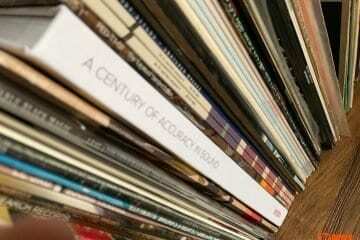 Apart from that, analogue audio sounds as you’d expect, with no real surprises. Since I started DJing digitally, I’ve always had an outboard audio interface along with a mixer as part of my setup, and never really considered the need for a mixer with one built in. Most of the time, the extra cable never bothered me. 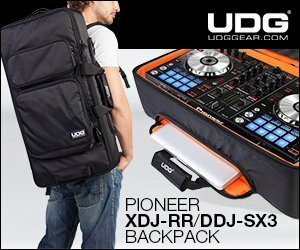 Having used the Xone:43C for a couple of weeks, both with Traktor and Serato, I can certainly see the convenience of the setup. I mean, I’m not going to run out and replace my current mixer/Audio8, as both are built like tanks and will hopefully last a long time. The audio interface is really loud. 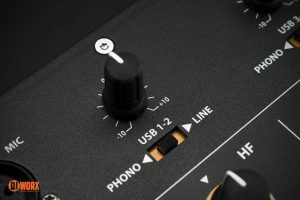 When in USB mode, channel gain trims need to be turned down very low to ensure the VU meters don’t redline, which is quite useful in giving you headroom for quieter tracks, a big difference from the line and phono modes. The Drivers for Mac use the hardware as the master clock for synchronising audio streams which is more stable than a computer generated clock, this provides very low jitter due to FMC™(Fixed-Master-Clock) technology. It also bypasses CoreAudio and uses the HAL plugin so you do not get any unnecessary sample rate conversion or the need for any clock recovery. This, in English, basically means the device drivers are much more reliable and have lower overhead since they have closer access to the hardware. I’d also imagine it would have some code to play nicer with Serato. 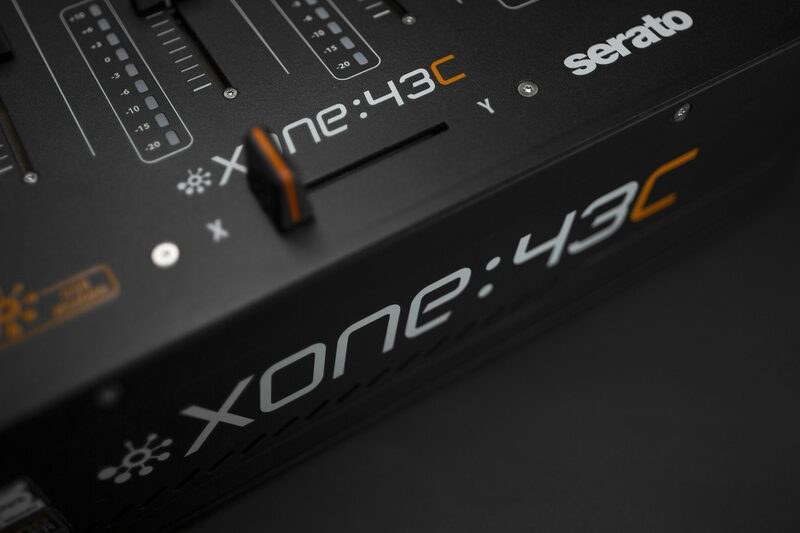 As mentioned, the Xone:43C comes with an audio interface which is “Serato DJ and Club Kit upgrade ready”. 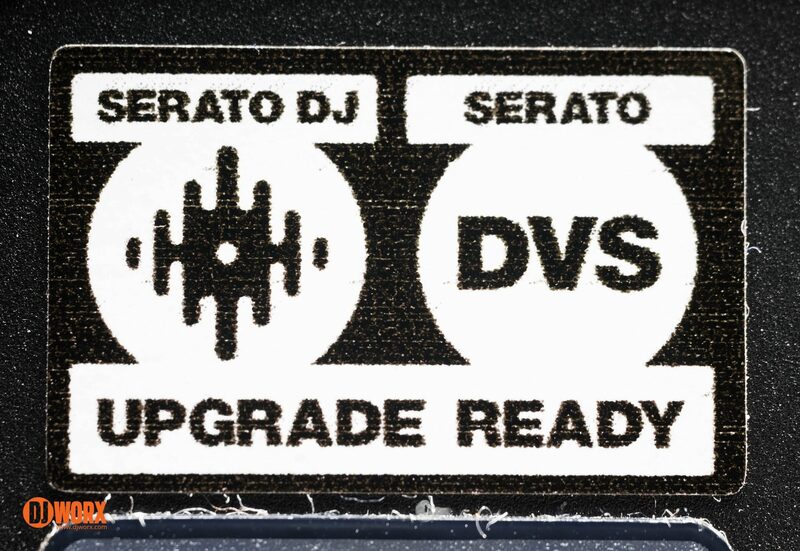 This means that although there’s no software bundled with the mixer, you can buy a handy kit that includes both the full Serato software and the DVS expansion pack for $170 (there’s often a special offer on though – Ed), saving you a few pennies. 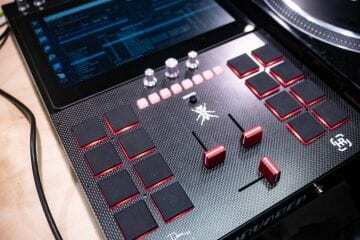 The Club Kit is designed as a “one-stop-shop” for gigging DJs so they have the confidence that their software setup is as plug-and-play as can be with common club mixers (hence the name). 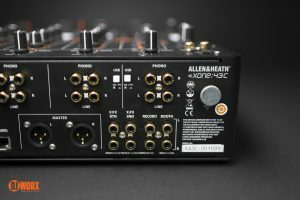 I’ve already gone through the list of issues I feel prevent this from truly feeling like the best of Allen & Heath, and hopefully the criticism is taken as constructive. Below are a couple of extra ideas that occurred to me during the course of the review. There’s nothing radical, just some wishes. Longer channel faders. Bring back the 60mm sliders of yesteryear. They’re much more precise and allow for smoother volume transitions. 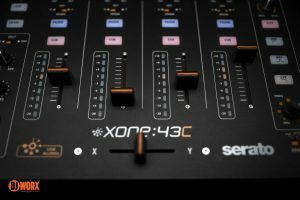 Xone club mixers were basically designed for House and Techno, which tends to have a lot of long blends in between tracks. We need those longer faders back! Everyone complains about their Chinese-built mixers, but the 43C feels top-notch. No wobbly bits and feels like it could survive a fall down a flight of stairs. Disappointingly minimal MIDI features, but you get a decent audio interface and Allen & Heath X:LINK. It’s a solid club mixer as well. 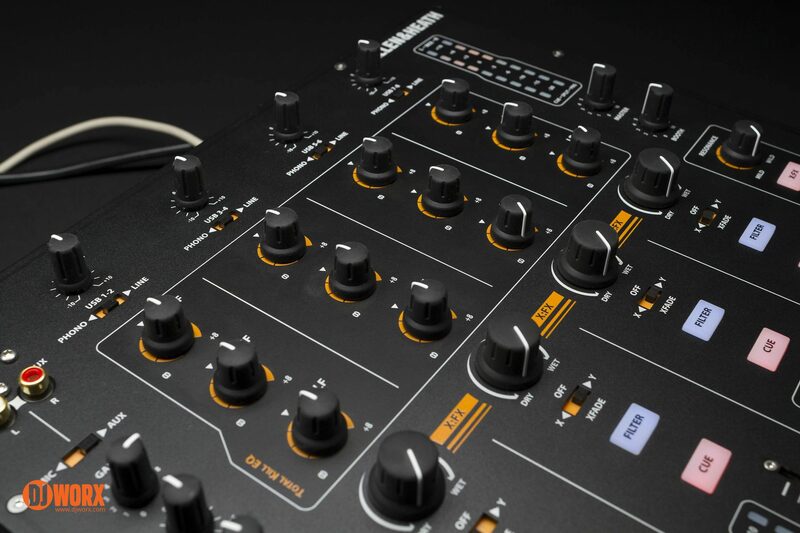 At £800, this slots in with the best four channel mixers. For that, you get a great sounding filter (bar the crackle) and the audio interface. Some of the changes from the older Xone models I struggle to agree with, but overall this mixer is a good four channel club mixer. 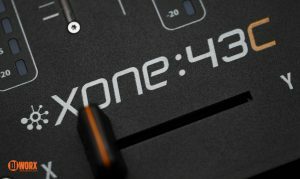 I admit I’ve been extra hard on the Xone:43C as it’s not just another mixer. It’s Allen & Heath. We expect the best from them because that’s what they gave us for so many years. It’s just a bit disappointing to see them lose a little of the magic that made them great. But that’s a story for another time. 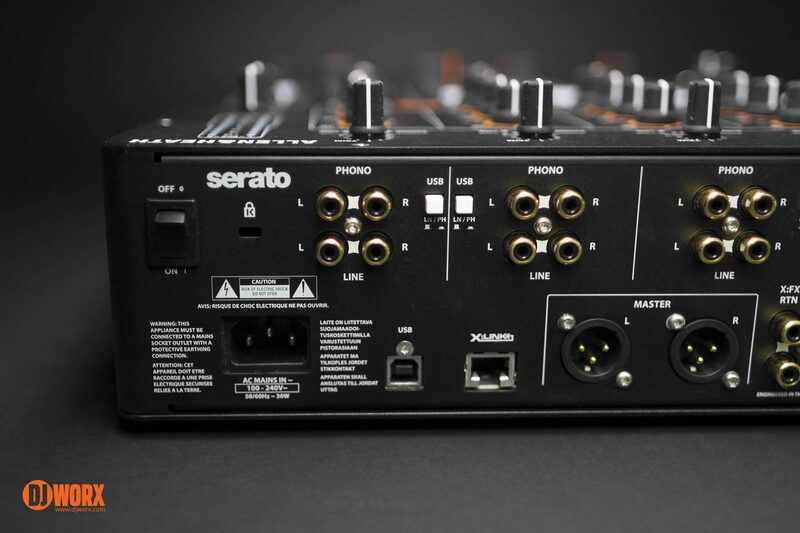 If you’re a Serato user, the choice between this or a Pioneer mixer is a tough one. Personally, I’d pick this as I prefer the Allen & Heath heritage and I’ve never particularly got on with Pioneer gear. 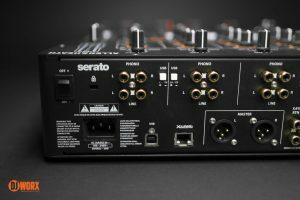 This mixer is made for Serato DJ and DVS. It’s plug-n-play, integrated and the vinyl control is responsive out of the box. It’s also got analogue audio in the chain, which is always nice. If you’re a Traktor user, the Xone:43C works great with Traktor Pro 2 (as I tried, with two X1s), gives you less equipment to worry about and looks great with Native Instruments gear. We can just hope that NI can find it in their hearts to get DVS officially working with the mixer. If that happens, this’ll be a complete package for a reasonable price. As a mixer in its own right, it sits firmly in the upper middle of the pack, but other than the Allen & Heath brand and the decent audio interface, the 43C struggles to stand out in ways its ancestors managed to. This is definitely a well built slow evolution of the Xone family, rather than the maverick hits that the 92 and DB4 were able to be. Here’s to hoping they take on board the issues and release a Xone:93C, and that I get to review it. Much to Dan’s consternation, I casually left the 43C in assorted places around the Worxlab. For Dan, a self confessed Allen & Heath fan, this was some sort of sacrilege. The only real fanboyism I’ve had in the DJ scene has been with Vestax, so to me the 43C is just another mixer. Don’t get me wrong, I love Allen & Heath — I love that they’re a British (or for their benefit Cornish) company, and that they’ve created iconic DJ gear. So my opinion of the 43C isn’t the same as Dan’s. I’m looking at the mixer without a reviewer’s magnifying glass and simply as a casual user of many mixers before it. My less detailed opinion is that the Xone:43C is a solid mixer. It’s not A&H of old, nor is it a DB2 or DB4. But does fit nicely into their mid-range offerings. To me, it’s a four channel box, filters, and an audio interface. In this respect, it is unremarkable in the market place. 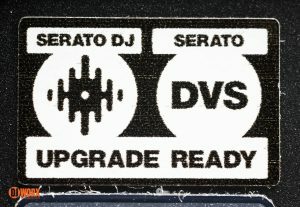 What makes it stand out is the Serato DVS compatibility, the proprietary X:Link that lets it hook up to other A&H devices like the K1 and K2, and the X:FX per channel effects send. In this respect, I really like it. 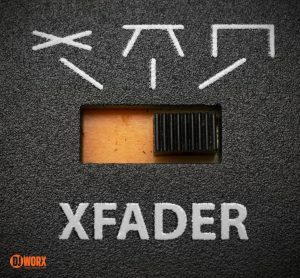 From a fader perspective, the Xone:43C is OK, but the 4mm crossfader lag and lack of curves knobs and reverses makes it less than ideal for scratchers, but you can at least drop a custom mini Innofader into it. I do wish that the line faders were 60mm. It’s not like there wasn’t the room. And the minimal MIDI implementation hardly seems worth it. MIDI linefaders but no crossfader, and a bunch of buttons with no EQ controls is odd. But this is only an issue if you want to use the 43C as a controller. 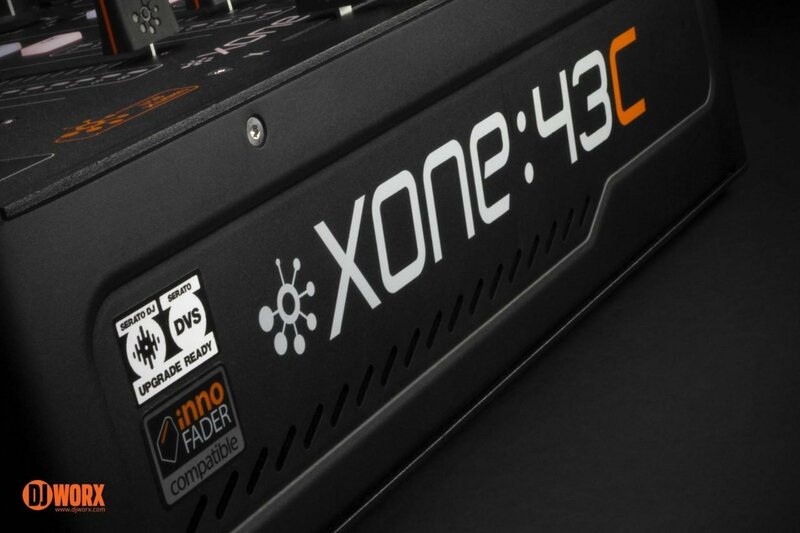 Niggles aside, there’s a huge amount going for the Xone:43C. And at the price, it’s a very solid option for the four channel market. And with the Serato DJ compatibility, the Xone:43C becomes a compelling product.